"The announcement from Macworld about the effective relaunch of the AppleTV is encouraging. 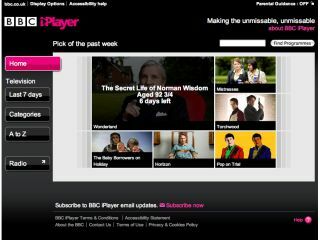 "This, coupled with Apple's (long anticipated) move to a rental model, means that we can look to getting BBC iPlayer onto this platform too, as we should be able to use the rental functionality to allow our programmes to be downloaded, free, but retained for a time window, and then erased, as our rights holders currently insist." If this happens it will, of course, solve a big problem for the Beeb. It has been roundly criticised by Mac and Linux users as well as open source advocates for limiting downloads to Windows Media users. It has even run into trouble with the BBC Trust, which insists that iPlayer content is open to all. The only way Mac and Linux users can view iPlayer content now is to watch streamed Adobe Flash video on the BBC iPlayer site. Let's hope Highfield and other directors at the BBC offer iPod-friendly downloads too. Now that really would be a step forwards.